There are so many things we take for granted. The ability to attend or tune in to an occasion like Nelson Mandela’s memorial service -- and be able to hear what’s going on -- is one of those things. Something that seems so simple isn’t that easy for millions of people. The media and many in the general public are having a field day with the news about the 'fake interpreter' at Nelson Mandela’s memorial service. Many are shocked this could even happen. When I first read about the situation on Twitter, I thought it was a hoax. It just doesn't seem possible -- someone with improper skills on the national stage with world leaders? The Limping Chicken, a UK-based website, was my first source for information on the story: 'Fake Sign Language Interpreter Mars Nelson Mandela Service for Deaf People Worldwide'. How ironic is it that a story like this is sharing the spotlight with someone who was focused on equality and human rights? And I think it's sad that so many people are reacting to the news by making jokes on social media and news outlets. It’s a little difficult not to be offended by all the jokes people are putting out there. You see, American Sign Language is my second language. I lost my hearing when I was five and rely on ASL in many situations. Rolling my eyes or gritting my teeth at occasional public mockery, being stared at and standing up for my rights has been part of my life ever since I can remember. But I’ve never seen anything on this scale before. A producer on NBC’s Today Show even crept on camera Wednesday morning, making fake sign gestures. Why are so many people so quick to make fun of things like this or try to deny people their rights? Is it because they’re uncomfortable or uneducated, or are they just engineered not to care? I hope it’s the former, because that’s easier to fix. Sign language is not universal. There’s American Sign Language, British Sign Language, French Sign Language, and so on. So far, no one has deciphered what -- if any -- language the unidentified man on stage is using. He appears to be repeating a few gestures over and over again. It makes a mockery of the true professionals -- trained interpreters who have studied and practiced their craft for years. I’m sure this story will fade into the background over the next few days -- something new will come along to grab the public’s attention. I’ll still be here -- sitting in the front row at church and the theater, setting up my Captiview system at the theater, watching the tiny ZVRS interpreter on my phone screen -- and writing about the ins and outs of life as a deaf person in a hearing world. But trust me, I don't take any of them for granted. And I hope you think twice before you poke fun at someone who's different than you. This year, I've gotten away from running -- mainly because of an injury but also because, well, truth be told, I haven't really enjoyed it. Getting a migraine every time I run a 5k -- no matter how hydrated I am -- isn't really my idea of a good time. I may run again once my foot heals. We'll see. I know Baxter would really appreciate it. In the meantime, I've been pushing myself to get out of my comfort zone a bit more this year. As an introvert, that's not always an easy thing to do. I've never really been fond of group-type exercise (this traces back to middle, junior, and senior high school traumas), but this year, I've made a genuine effort to try out some new classes. After all, we're all supposed to be adults here, right? And you know what? I'm enjoying them! I've tried yoga with three different instructors and found one I really like working with. I've also tried a deep-water cardio class (yes, with the old ladies, but in the deep end of the pool!). I had a streak of 6 weeks in a row of Monday night yoga going -- broken only because of a migraine this week. 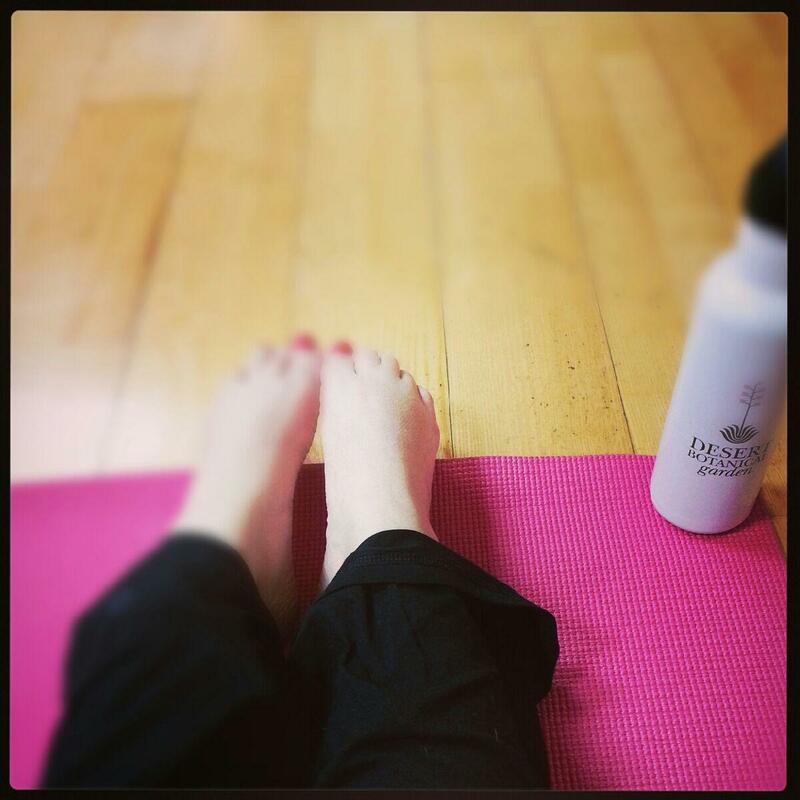 I love, love Monday night yoga. I'm getting stronger all the time. It's the best part of Mondays for me and I look forward to it every week. Yoga can be a bit of a challenge for a deaf person, as many of the poses require you to have your head down/in a relaxed position while you listen to the instructor. I've learned to let things go, to do what I can, and that the more I practice, the better and more comfortable I get. They call it yoga practice for a reason. Yoga's second challenge is the balance factor. Balance has been a huge issue for me ever since I lost my hearing when I was 5. Many people don't know how hard I've worked to get my balance to where it is today. I'm very lucky that I have a stubborn streak and parents who were willing to drag me to and from gymnastics and swimming lessons, to the barn and horse shows, and to encourage me to keep on picking myself up off the ground, get back up and do it again. And again. When I first came home from the hospital after a battle with meningitis (I won, but my hearing was lost forever), I still remember vividly not being able to stand up, of falling over all the time. Walking uphill was a challenge. Downhill? Downright dangerous. For some reason, the balance thing stands out more in my memory than not being able to hear. I'm not quite sure why. Maybe because it was something I could battle myself, something I could control little by little, and slowly overcome. I remember swimming lessons that turned into chaos when I had to dive underwater and I could not tell which way was up, down, or sideways. (I went on to swim in college.) Horseback riding and gymnastics helped fine-tune my balance; falling down never really seemed to hurt my pride. I'd just brush it off and get on with things. A family trip to Montana's Big Sky country tested my resolve -- and probably the patience of everyone on the trip with us -- as the altitude threw my balance so off-kilter that I could not stay upright on cross-country skis at first. The stories go on and on. Today -- nearly 35 years later -- I still struggle with the balance, still push the limits, and still smile. And yes, I still fall. I just fell in yoga class a few weeks ago, toppling over after losing my balance trying to deepen a simple pose. Lisa, meet wall, meet water bottle, meet floor. All I could do was laugh at myself and then try to contain the giggles for the rest of the class. And then on days like today I beam because I have made -- for me -- a large improvement in the tree pose, actually standing on one foot, looking off into the horizon, breathing deeply. In yoga, you are working on yourself and how your body is in that moment -- you are not comparing yourself to anyone else, not even your former or future self. Just here and now. Allowing yourself to simply be is a really good feeling. It's taken me a long time to learn that.